The one I mostly photographed was extremely active once it knew that a superior intelligence was on its case. It scuttled about on the eggboxes, hardly ever stopping long enough for me to focus. I think that it was building up enough energy after a night's sleep to take wing, which it did after about three minutes, most impressively. I specially like its deely-bobber antennae, here in action below. They clearly advise it about obstacles ahead. Wouldn't it be great if they evolved to change colour, chameleon-style, like traffic lights. I'm going to seem like a leg fetishist after yesterday, but I couldn't resist the almost-human pose of this Poplar Hawk which proved its longevity by coming to the trap again; another visit next week and it - or its relatives - will be into their fourth month. Things are quiet otherwise, or rather unspectacular. There was a nice Peppered moth in the trap this morning, a score of Large Yellow Underwings, half-a-dozen Dark Arches, three Shuttle-shaped Darts (left) and at least another 20 smaller bods. So even a quiet night shows, yet again, how much starts happening after the sun goes down. I often forget that moths' legs can be helpful in identification, for example in my muddle the other day over the Dingy and Buff Footmen. The Dingy has dainty little pins whereas the Buff has sturdy calves of the sort which (she says) first attracted Penny to me. Moths' legs are interesting too. It must be exhilarating to have six for a start, and they come with all manner of spurs and hairs to assist perching (possibly) and mating (definitely). But they tend to remain hidden. Like the Victorians who allegedly went to the lengths of covering table legs in the most puritanical households, moths wrap their wings over their undercarriage. So this Spectacle is a saucy exception. 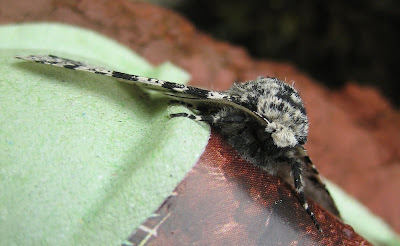 The second picture shows it from the side, with its distinctive quiff; one of the most regular of all my visitors. It was the very first moth I showed on this blog when I started light-trapping in June 2008. Here's a picture I took then, showing more clearly the reason for its name (and, if you look carefully, a Mona Lisa hint of a smile). It's nice to spend a day at somewhere timeless, among children doing exactly what we did 50 and more years ago. Much has changed in the world, mostly for the better, but the middle stepping stones at Bolton Abbey still present a challenge to anyone aged under ten, and many much older than that. There are still plenty of grasshoppers, too, in the Valley of Desolation where we had a picnic above one of the waterfalls which drop like something out of a tourist brochure for South America into clear and swimmable pools. Here's one, unusually tightly-focussed for me. I have no idea what kind it is but perhaps there is a Caeliferist out there who does? Nothing unusual came to the trap on a warm night. We're into the season of Yellow Underwings and allied brown pals which account for most people's lack of interest in moths. But let's enjoy the exquisite pattern of this Marbled Beauty - and also the rather fascinating dimpling of the lamp collar. It looks as if Mousey Thompson had decided to extend his style of furniture-making - lots of 'pockmarks' in the wood - to silver or aluminium. And here are two examples of a 'small brown moth' which actually turns out on closer inspection to have a complicated and attractive pattern (double-click on the pics to make them bigger). It's the Shuttle-shaped Dart, the darker female above and the male below. The name has a resonance round here, where flying shuttles are an important part of our history. Exactly four months ago, I featured this lovely moth under the headline Herald of Spring. Now here it is back again, announcing the imminent August holidays. By chance, I decanted it from its eggbox on to a red towel and then it took off and landed on a geranium. Hence the gaudy backdrops. 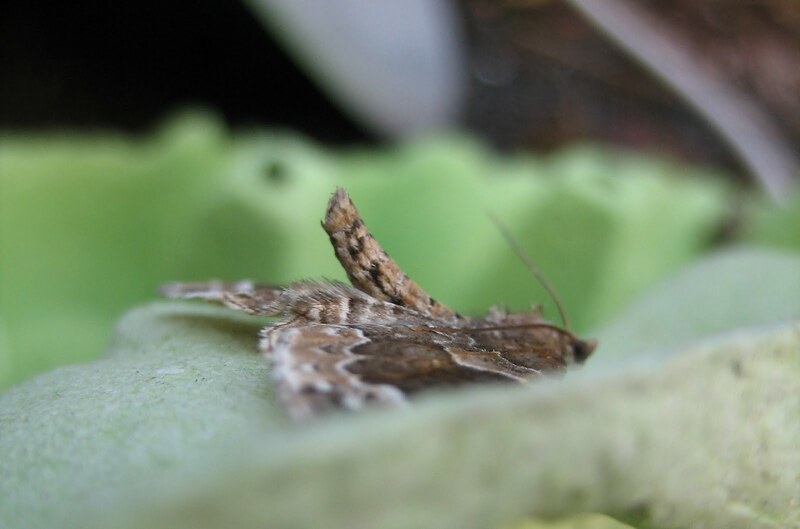 The Herald is one of the great stayers among UK moths. Hatching in July, it flies until the cold weather comes in late autumn and then tucks up and hibernates for the winter. Back in March, I chattered about this practice, and two days later found a specimen snoozing in our garden shed. Springtime sees it on the wing again and then the cycles starts anew. It couldn't happen to a nicer moth. As for this tiny creature, I can proudly announce that it is Blastobasis lacticolella, a foreign micro moth which has established itself here. Not to everyone's joy because if it gets into your larder, it will nibble away. You can see from the eggbox print how small it is. I almost missed it. 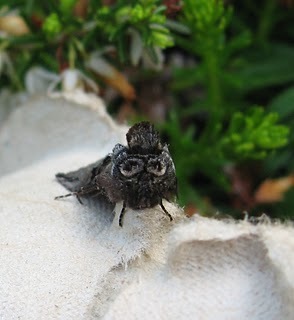 My unusual confidence in its identity comes from the fact that Charlie Fletcher, our county moth recorder, kindly nailed it for me while also sorting out the Garden Pebble moth. I think we have a couple of investigative Dun-bars here, each choosing a different eggbox cone in which to probe. My confidence in identification is much-battered, so I am being tentative. And, as always, I will correct all errors as prominently as the most powerful Press Complaints Commission could require. I'm pretty sure, however, that the right-hand character on this rockery plant is either a Common Rustic or - more likely if size is a guide - a Lesser Common Rustic. There were half-a-dozen of these in the trap this morning along with many types of Yellow Underwing, lots of Riband and Twin-spot Waves and what I now know, thanks to Bill the Commentor, to be a Buff Footman. But what is this? (Ah-ha, see update at end of post) It's completely distinctive but I can't tally it with anything in Waring, Townsend & Lewington, not even the Snouts whose tribe I first suspected. Is it a micro, in spite of its size? Or a Snout after all - Pinion-streakled? Buttoned? - within a wider range of variation than WT&L have room to show? Solutions warmly welcomed; meanwhile I'll sign off on a bright note. The sun has brought out both our buddleias and lots of butterflies. Here's a more than usually raggedy Comma absorbed in the tresses' great gusts of honey scent. Update: my reliable crutch in identification matters, Charlie Fletcher the county moth recorder, identifies my mystery moth as the Garden Pebble - a micro but a pretty macro one. It likes cabbage and is therefore described as 'a nuisance to gardeners.' But I don't grow cabbages, so it is very welcome here. 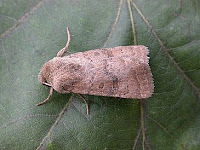 Oh and I did get the Dunbar and Common (or Lesser Common) Rustic right. You can't distinguish between the last two without some rather uncomfortable medical examination. The Satin Wave on the other hand has done well with its Christening. Update: Except, see Comments, this isn't one. MW muddles through again...how embarrassing. 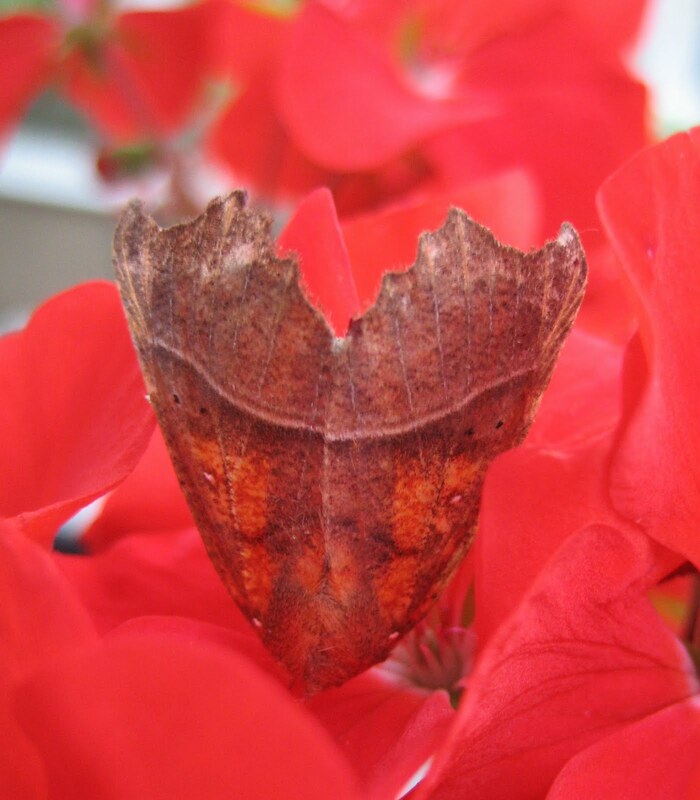 Deservedly, because as you can see, it is a pretty little moth. I disturbed this one in bright sunshine while putting the finishing touches to my late Mum's garden in readiness for our spectacular fun day in her memory today. Please keep sun-dancing; things so far look promising if a bit 'mixed' in the Met Office's favourite word. There were good butterflies around yesterday, too: Red Admiral, Small Tortoiseshell, Comma, whites, skippers, Holly Blue and this Gatekeeper, seen from afar. I had the camera on as much zoom as my ancient and slightly trembly hands render worthwhile; sorry the focus isn't sharper but you can make out the almost perfect white and slightly-chequered trim to the wings which suggests that this specimen is very newly-hatched indeed. I've cropped out the dead-heading which was still to do. I'm afraid I concentrated on that, rather than chasing the butterflies which were very jittery compared to light trap-doped moths. It's always Spring time for an eager young moth, not surprisingly since most of them have only a few weeks in which to fulfil their Darwinian duty and breed. Here are two more displaying that rather obvious (to the human eye) sign that they seek a mate; either releasing pheremones or possibly 'whispering' ultrasound love messages as per the post of a couple of days below. The patterning on these little Carpet moths is lovely (and responsible for their name; they don't eat carpets or anything else in the fabric department). Like Persian rugs, however, many of them are much alike and therefore a source of constant confusion to yours truly. I think that these are a Phoenix, top, and a Common Carpet, just above, but the latter may be a Broken-barred Carpet. Or, potentially embarrassing, are they both Phoenixes, showing how varied individual species can be in detail? I'm hoping that Ben Sale will come to my aid. Here they are again in the same order, showing their Come Hither mechanisms at work. I must away, meanwhile, to sort final preparations for a major fun day in memory of my late Mum in her garden tomorrow. Please join in prayers, ultrasound whispers and anything else for sunshine in Leeds. Incidentally, I've already boasted here about how my Mum's best friend at school, Miggs Middleton, is the lovely Kate (and Pippa)'s great aunt. Now one of my uncles recalls that Mum's first date, at a dance at RAF Dishforth during the Second World War, was with Peter Middleton, our lovely princess's late Grandpa. How Royal am I! I go for the Vapourer, shown here courtesy of Dr Chris Gibson of English Nature, or Natural England as they've renamed it for reasons unknown. It gives the same impression of a small face peering through curtains of russet hair. 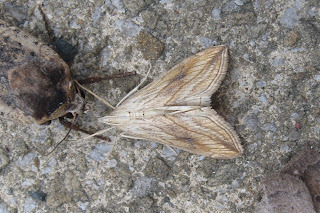 As for the Murdochs, what else but the Uncertain (right) and Confused (below); or should these two moths be representing Messrs Stephenson and Yates? I know and hope that, in general, blogs like this are a refuge from the weird world of London politics. But I can't help wondering after watching yesterday's events whether we all mean the same thing by words such as 'integrity'. Talking of which, many thanks to the outstanding website UK Moths for these pictures. Anyway, enough of that. Here are a Green Arches and a Muslin Moth to remind us that there are plenty of delightful things out there in the dark as well. Happy 189th birthday to Gregor Mendel too! See Google's excellent pixie today. Thanks to him, our sweet peas are coming along well. Males of the Asian corn borer moth (Crambidae) were recently shown to whisper extremely low-intensity ultrasonic courtship songs close to females. Never let anyone tell you that moths are boring - even corn-boring ones. 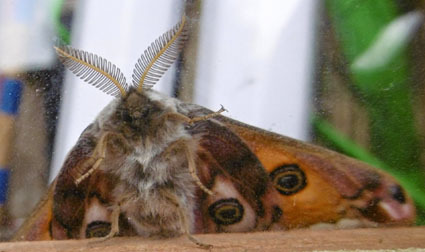 And here's an enticing moth's-eye picture of the approach to my light trap just to round things off. Indeed it does. Here it is in December 1985 when I was standing at the bottom trying to work out a way to the top. 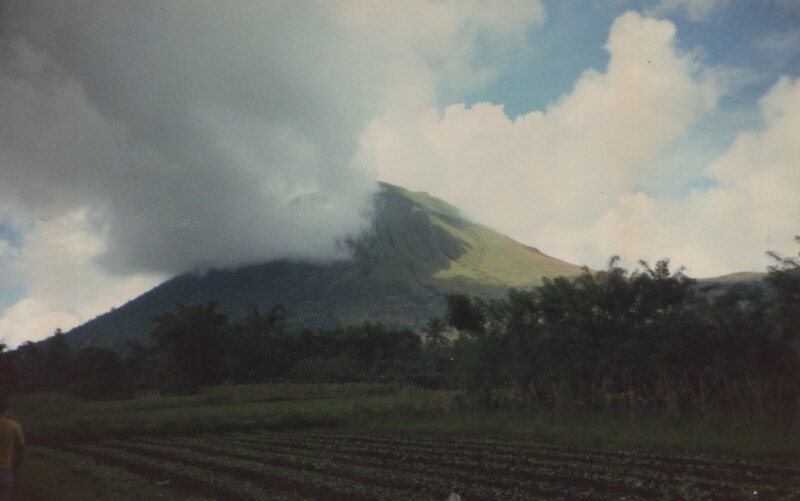 The smudgy zigzag to the right of the peak looked promising; it was a rare day of sunshine in usually humid, cloudy Sulawesi (formerly Celebes); and the whole scene was pleasantly reminiscent of Blencathra or somewhere like that. In the event, what appeared from a distance to be springy turf was head-high elephant grass whose leaves have edges so sharp that you're sliced before you know it. 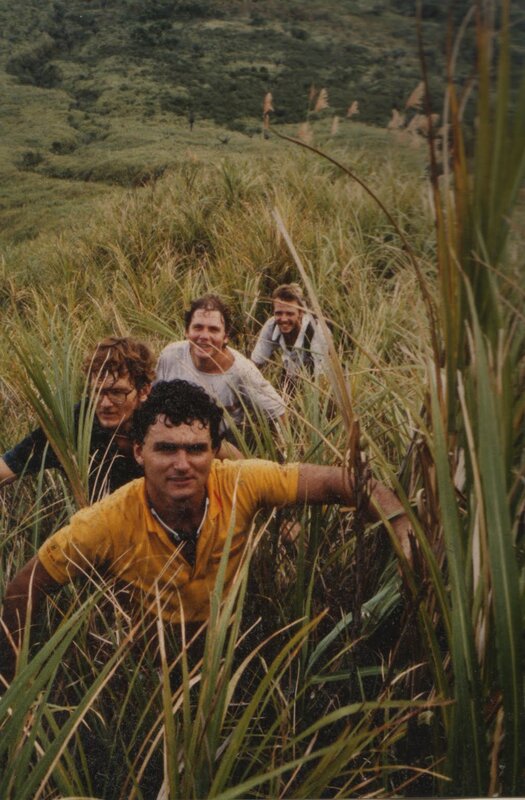 The five of us (on an expedition organised by the Royal Entomological Society, which is at least a link with moths) soon looked like members of a flagellants' club. Worse was to come. The summit seemed a humdrum place with several empty bottles of Bintang (Star) beer dumped by previous visitors, but the descent was a nasty reminder that volcanoes need treating carefully. 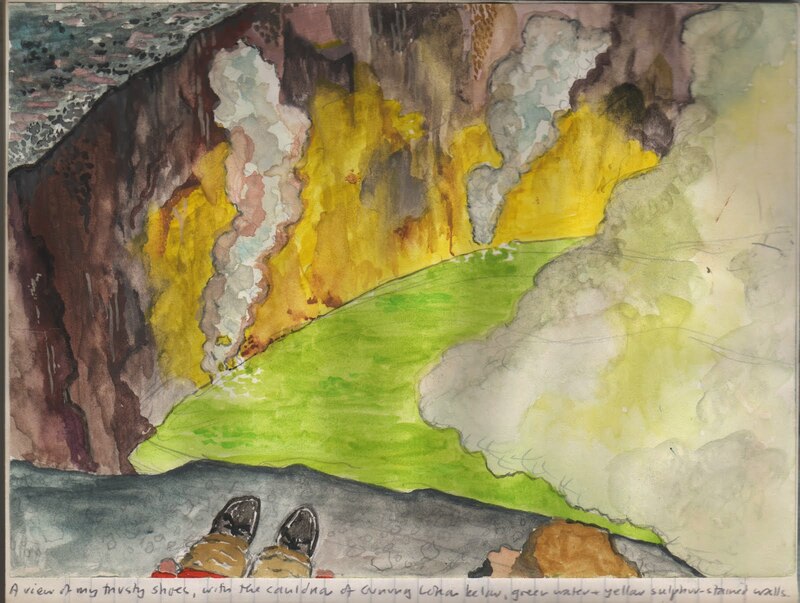 We were puzzled by the apparent absence of a crater but soon found ourselves unable to see anything more than 20 yards away as we climbed down into a thick, hot and sulphurous world of steam. The climb became a slither, but luckily the eerie canopy lifted in time for us to see that too much more sliding on the rust-coloured scree would take us - woosh, plop! 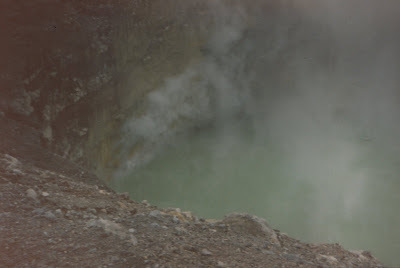 - over the rim of the crater into bubbling, boiling water to add flavouring to what looked un-nervingly like pea soup. I can genuinely say that the colours in my very amateurish watercolour are more true to life than the muddy effort of my then inadequate camera. We returned to base camp in the Dumoga-Bone rain forest wiser and more cautious than we were before. A new moth this morning and one I'm glad to see because I've noticed its picture in my moth Bible in the past and thought: well, that's one even I couldn't get wrong. 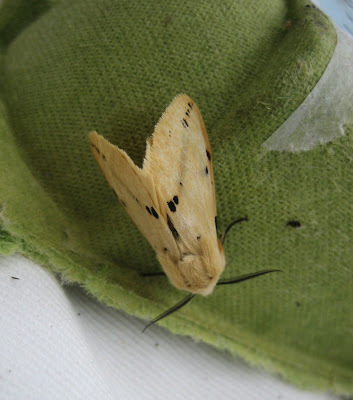 It has an idiosyncratic pattern of pallid colour shaped like an egg-timer or Marilyn Monroe, although in the latter case the comparison ends there. Mind you, this one seems to have two small security staff scurrying about. I can't tell you how many little flies like that come to the trap at the moment. I don't know why the Double Lobed hasn't been here before as it's apparently common. However, the book lays it on thick about how much it likes damp places and Leeds definitely qualifies in that respect at the moment. 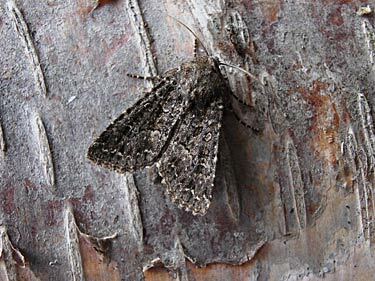 I've posted a lot about the Peppered Moth in the past and you can spend all day Googling about its special place in Darwinian theory and all the counter-attacks of the Creationists. I have better things to do, embarking on Day Two of majestic birthday celebrations for Penny, but here are a couple of pics cos it's such a lovely creature. A propos the Darwinian side of things, melanistic specimens are getting rarer and rarer these days. I've not had one here for at least two years. Moths are masters of camouflage and here is a Marbled Beauty to give us a lesson. Now you see it - below. Now you don't, or hardly - above. It's also a moth with a fondness for old buildings according to the experts; presumably plenty of crumbling plaster and flaking window frames can help it to hide. This morning's other little star is this beautiful Tortrix moth, a micro which deserves the term as my special Penny Wainwright Pencil Scale shows. After much Google-imaging, I am pretty sure that it is Acleris forsskaleana whose surname intrigued me, so I clicked and Wiki-ed on. It's worth reading the entry on Pehr Forsskal, whose name was given to the moth by Linnaeus himself, who also Christened a plant after the young Finn because it was similarly tenacious and stubborn. 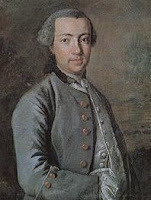 Forskkal seems to have been an all-round good egg, writing a Treatise on Civil Liberty which the Swedish authorities promptly suppressed. Here's a Wiki-pic of him looking tenacious but nice. What on earth would the moth make of all this? If there were a country called Mothland, maybe this could be its flag. I always enjoy pictures where moths seem to be reading the instructions and advertisements on the eggboxes. This morning, the happy coincidence of an eggbox (complete with Angle Shades moth), red towel and grass looks like the banner of a freshly emerged nation. 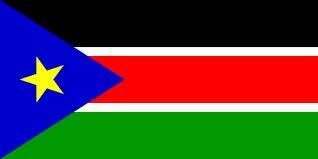 Here's the latest, for example: the flag of South Sudan. 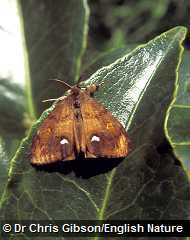 The Angle Shades has a particularly sophisticated version of the shuttle-shaped marking common on the wings of many moths. Here's another example which visited last night: the Shuttle-shaped Dart with its neat little needle's eye. It reminds me of a clergyman. The eggbox seems to be imitating an advert for 'Jaws'.